Our son Timo Wilson took his life at age 17 after a long struggle with severe anxiety and Obsessive Compulsive Disorder. 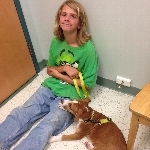 A beautiful, fun-loving soul who touched so many people with his empathy, Timo could not overcome incessant, intrusive thoughts, despite the efforts of dedicated neurofeedback, psychiatric and therapy practitioners, and of course lots of love from family, friends and his beloved hound, Stevie. Please join our family in making a small donation toward the study of these and other afflictions of the brain, in the hope of preventing this tragedy from happening to others. Why support the Brain and Behavior Research Foundation? • 1 in 4 Americans live with mental health disorders. • The Brain and Behavior Research Foundation (BBRF) awards grants that will lead to advances and breakthroughs in scientific research for major mental illnesses. Since 1987 BBRF has awarded over $300 Million to 3,700 scientists and research projects leading to discoveries, causes and treatments of mental illnesses, including schizophrenia, depression, bipolar disorder, anxiety disorders, and childhood psychiatric disorders, among others. Moreover, all of the Foundation's operating & overhead expenses are covered by two family foundations. This means that 100% of other donations go directly to its scientific research grants. Since 1987, the Brain & Behavior Research Foundation (BBRF) has awarded more than $380 million to fund more than 5,500 grants to more than 4,500 scientists around the world. 100% of contributions for research are invested in research grants to neuroscientists thanks to the generous support of two family foundations which cover BBRF operating expenses.